Images, CSS files, scripts, clickable hyperlinks are basic elements of a webpage. Manually checking individual URLs of such elements is a tough routine. 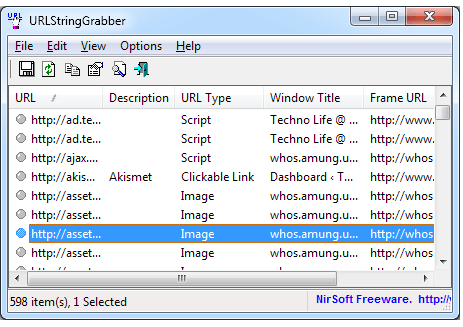 Using “URL String Grabber” portable free utility you can easily extract and view URL details of images, CSS files, scripts, RSS feed, swf flash files on webpages opened in Internet Explorer. It only supports websites opened in Internet Explorer version 6 through 8 on Windows 7, Vista and XP computer. 1. Download URL String Grabber program. Unzip downloaded file and double click program exe file to launch the utility. 2. It will automatically scan webpages currently opened in Internet Explorer browser on your computer. Program window will display URL details in tabulated manner including: URL, description, URL type, Window title, Frame URL. 3. You can double click on specific item to see more details of specific URL listing. It also allows you to save URL details or generate HTML report for the same. For sure a handy utility to easily discover URLs of different elements on webpages being browsed in Internet Explorer browser without too much effort.